Great Pacific War is a sequel to our old, long out-of-print Third Reich game, and a complete game in its own right. You can play the two games together for a massive re-creation of World War II, but each of them also plays just fine on its own. Great Pacific War tells the story of World War II in the Pacific and Asia, with three full-sized maps stretching from Hawai’i to Ceylon, and from Australia to Siberia at a scale of 60 miles across each hexagon. The United States, assisted by Great Britain, Australia, the Netherlands, China (Communist and Nationalist) and eventually the Soviet Union, faces the Japanese Empire. It’s a fairly intense game, modeling interwoven military, political and economic factors. The currency of Great Pacific War is the Basic Resource Point, or BRP. These represent all the different sorts of resources necessary to make war: labor and manpower, industrial output, raw materials. The Western Allied powers, particularly the Americans, have lots of these; the Japanese, not so much. The Chinese depend heavily on American aid. To fuel their war machine, the Japanese therefore depend on conquering and holding resource-rich territories, and also want to deny their enemies supply routes to China. Japan faces war on multiple fronts, starting with the never-ending conflict in China. In the early stages of the campaign game (which starts in 1937), the Japanese are limited in how great an effort they can make on the mainland, lest they hasten American intervention in the war. Once the war spreads they have the need to strike south for the oil, rubber, rice and metals found in Indochina, Malaya and the East Indies. At the same time, they must shore up their eastern flank against the inevitable and overpowering American counter-attack. The game takes place as a series of quarterly turns (that is, each turn represents three months of “historical” time). During the first stages of the campaign game, the Japanese conduct a limited war against China while trying to shore up their position elsewhere without provoking the sleeping American giant. Players keep track of increasing tensions (things are made tenser by Japanese actions, and just by the passage of time), and the Japanese player must decide the right time to strike – when the Americans are not yet at full alert, but after he or she has had enough time to improve Japan’s economic and military picture. Or the Japanese can just ignore American politics; the United States will eventually enter the war but it’s not a given exactly when this may occur. Once the United States enters the war, it becomes a wide-ranging naval, land and air affair. 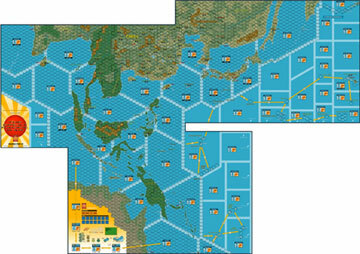 Like that of its out-of-print sibling Third Reich, Great Pacific War’s map is divided into hexes on land, and hexes (for air movement) plus sea areas (for naval movement) on the sea. Where Third Reich is a land game with naval actions as a secondary aspect, in Great Pacific War the opposite is true. There’s a lot of blue water between the initial American/Allied bases and the Japanese home islands, and the fighting is going to be based on American attempts to cross that ocean and seize bases to enable the advance, and the Japanese effort to stop them. Designer Brian Knipple, when working on our version of Third Reich, hit on a simple yet utterly brilliant mechanic to entwine resources and combat results in a very historically accurate way. Combat is resolved by our favorite method here at Avalanche Press: “roll a 6, stupid.” Put simply, you roll a number of dice equal to the combat strength of your unit(s). For every result of 6, the enemy suffers one “hit.” Land units can shrug off some hits if the player expends BRPs instead. That allows for attritional warfare without any special rules. And you need to spend BRPs to keep your offensives rolling; without them, you can defend (though at a serious disadvantage) and it’s hard to move those ships and planes without fuel. 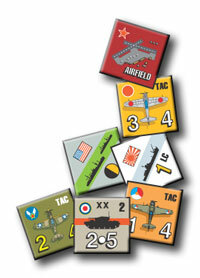 Roll-a-six is pretty much the basic concept underlying all three types of combat in Great Pacific War: land, naval and air. Land units include infantry (with specialist types like Marines and Airborne), cavalry, armor and garrisons. Garrisons can’t move; Marines are extra tough in amphibious operations, and cavalry and armor (especially armor) have special abilities to exploit breakthroughs in enemy lines (and tanks are usually more powerful when attacking). Naval units consist of surface vessels (battleships, cruisers and the like), submarines and aircraft carriers. Each has their strength and weakness, though aircraft carriers are particularly potent thanks to their ability to project air power anywhere on the map. There are two types of air units, strategic and tactical. Tactical air is very flexible, able to fight in land or naval combat as well as defend against enemy strategic bombing, while strategic air can do those things (at limited capacity) and also affect the enemy’s economy (in game terms, attacking cities to reduce the target nation’s BRP stockpile). Victory is determined by the American subjugation of Japan: the sooner it happens, the greater the glory. Japan is so vastly outgunned and outnumbered that the Empire has little chance of military victory (it’s not impossible, but it is highly unlikely). The United States wields a vast array of air, naval and land units, all of them of very high quality. And it has the BRPs to keep them operating pretty much continuously. Japan has some powerful units (some of its infantry, its Marines and aircraft carriers), but lacks the armor to conduct sweeping land campaigns and the BRPs to keep either her fleets or armies operating over and over like those of the United States. The Japanese are unlikely to ever replenish their pre-war stockpile of BRPs, so they must strike quickly and then hold on as best they can. They face a never-ending quagmire in China – neither Chinese faction has many good units, but it’s going to be nearly impossible to end the Chinese campaign. Meanwhile, the British in the Indian Ocean and Burma must either be dealt with (again diverting scarce forces and BRPs) or held off somehow. 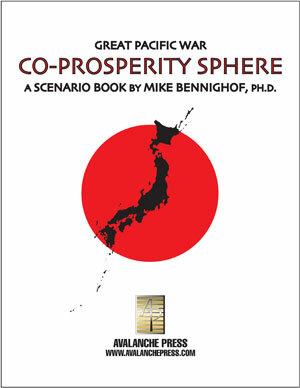 Japan becomes a match for the United States in the expansion book Co-Prosperity Sphere, which presents a Japanese Empire that has seen almost every event of the early 20th Century go in favor of Japan’s increasing power. Alliance with a puppet Chinese Empire and control of eastern Siberia, the Philippines and Hawaii provide the resources to stand up to American aggression in the Pacific. To win this game, each side will have to defeat the other on the battlefield – it’s no longer a case of destroying Japanese power earlier or later than the historical date. There are four new scenarios and 100 new playing pieces. Great Pacific War is a challenging game; altogether it’s probably our most complex game as a whole but each single mechanism is pretty intuitive (roll the dice, hope for sixes) and they’re interwoven pretty cleverly. And with its price slashed in half, it’s something you really shouldn’t pass up. 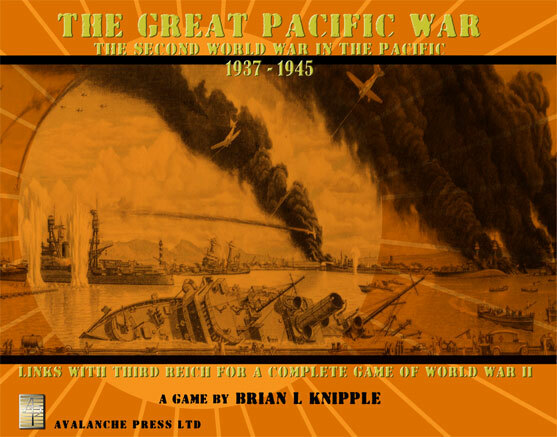 Click here to order Great Pacific War right now!